Its Wednesday night and you can feel the energy in the crowd. A sea of Laurier students gathers in the Theatre Auditorium patiently awaiting the arrival of Oshawa based singer-songwriter and R&B artist, Daniel Caesar. Just days before his arrival onto Golden Hawk territory, Caesar was performing in Vancouver, BC at the 2018 Juno Awards. There, he accepted the Juno Award for R&B/Soul Recording of the Year for his 2017 album Freudian. With this win under his belt, the excitement for his arrival revved up. 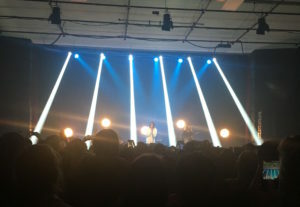 The concert opened with a short set by Blaise Moore, a moody-modern singer-songwriter from Toronto, ON. The songs on her debut EP, Laurence, are emotionally driven, conveying the story of her breakup, with emphasis on themes of revenge. Without much introduction to her music or herself as a performer, Moore let her music speak for itself, leaving the audience interested to discover more about her. The smooth tonality of her sultry voice gives her music a consistent sound. Once Moore left the stage, you could feel the anticipation in the crowed as fans grew impatient awaiting Caesar’s arrival. Fans were hungry for more (not Moore), and repeatedly chanted “Daniel” until he finally emerged at 10:30pm. Caesar stepped on stage, wearing a grey Freudian hoodie, and immediately made the room come alive. His set began with “Japanese Denim”, a rich and soulful R&B single released in 2017. The audience was instantly intrigued and attentive to every lyric escaping Caesar’s lips. Right from the onset, you can tell that Caesar sings with passion, closing his eyes and connecting to every lyric uttered. His range allows for the execution of perfectly precise high notes and soulful, harmonic low notes. The setlist was perfectly curated, encompassing rich R&B tracks like “Get You” and “Hold Me Down”, along with smooth soulful songs like “Transform” and “Death & Taxes”. Caesar’s music has a consistent softness, with gentle tempos, smooth R&B beats and gospel influences. Caesar made the concert an interactive experience, encouraging the audience to sing along. He provided opportunities for the audience to harmonize and take the lead vocals on tracks. Specifically, during “We Find Love” and “Take Me Away” the audience took part in the group-vocal moment, acting as an in-house gospel choir. Although Caesar is a young, up-and-coming artist, the maturity of his voice cannot be overlooked. Throughout the concert I kept thinking that his live vocals sound just like his studio recordings. During his live performance, he elevated and further texturized each track I’ve listened to countless times on Spotify. The feeling of a full band behind him, including drums, guitar, bass and piano, gave each song a fresh and vibrant depth. The show was very intimate, facilitating a close connection between Caesar and every member of the audience. Caesar sang from his soul, making it feel as though he was singing to a group of his close friends, rather than a sea of strangers. Relive the night, or experience it for the first time by listening to my Daniel Caesar concert setlist on Spotify.